How Can I Cover Up The Taste Of Kava? We all know how Kava can help with issues of anxiety, stress or depression, right? And there’s no doubt it can give you that general feeling of wellbeing or put you into that blissfully peaceful state that can last throughout the day and well into subsequent days for some people. But what good is that when the taste of chugging down a shell is enough to knock the hind legs off a camel? I know some hardhead kava drinkers actually like the taste of neat or unadulterated, traditionally-prepared kava simply mixed with water – or, at least, claim to – but it’s definitely an acquired taste. A lot of this, by their own admission, has to do with the fact that they know that the serene state acquired by imbibing the Kava root is about to hit them, so that what is actually happening is their body is priming for a good feeling and this is enough to outweigh any negative taste that the root drink can impart. What does fresh Kava taste like? 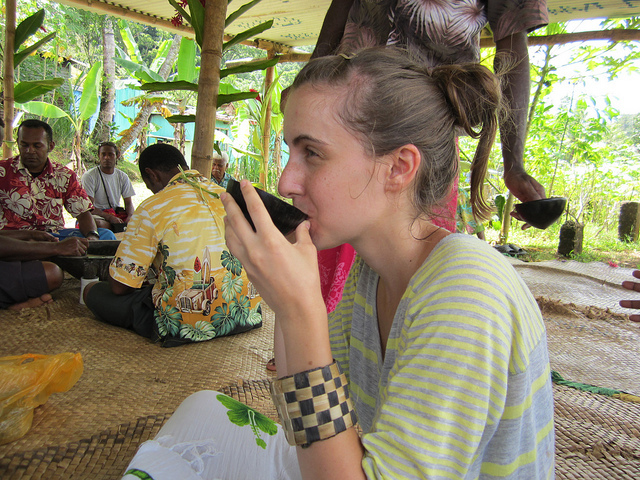 It’s difficult to describe the taste of a freshly prepared shell (or cup) of Kava. All Kavas taste differently depending on the cultivar and where it is from down to how it has been stored and for how long since it was processed from the raw root. Many folk describe the taste as earthy so that is a good starting point. We all know that it looks like a bowl of muddy water – so that description of the taste tends to stick in our brains. In my experience, depending on the type (cultivar) of Kava it can taste anywhere from a fresh, woody (almost a pine taste) that is somewhat drinkable to sickeningly vile mud water that makes you want to throw up at the slightest sniff. There is often an aftertaste of spiciness which possibly imparts from the fact that this is a member of the pepper family (hence its scientific Latin name piper methysticum – intoxicating pepper). And, of course, there are the mouth, tongue and throat-numbing properties of the plant, which is not always to people’s tastes, although can generally secure the knowledge that what you have just drunk is a good Kava with the desired psychoactive effects. Add to this, if you are drinking a Kava that has been imported from one of the Pacific Isles where it grows such as Vanuatu, Hawaii, Tonga or Fiji and has been sitting around in a warehouse for a couple of months and this can only make the taste worse. Due to the overwhelming negative connotation of the taste of this root drink, there has sprung up a whole art form dedicated to disguising the taste of Kava. There are a number of ways that folks have attempted to do this ranging from mixing the kava drink with fruit juices or other kava mixers to using chasers to take the edge off. Perhaps the simplest thing that Kava drinkers do to lessen the impact of the taste is to choose a Kava that has a mild taste in the first place. Believe it or not, there are some cultivars of noble Kava that actually don’t taste too bad. If you take into account types of grind, preparation methods or include some of the instant Kavas or pre-mixed Kava drinks, then you can actually find a Kava that is quite mild tasting or, at least, palatable, especially when strained properly. Personally, I have found some of the Fijian and Tongan kavas to be amongst the mildest tasting. Fijian Loa Waka and Tongan Pouni Ono are two of my favourite Kavas that come with a decent amount of potency but with a mild taste that does not prompt nausea from the get-go. Good tasting Kava tends to be lighter in color, in my experience, and the fresher you can get it the better. There is sometimes a hint of fresh woody pine rather than the deeper earthy notes of some other Kavas. As well as picking out or researching mild tasting Kavas, there are a number of products on the market now that pre-mix Kava into commercially available drinks or more palatable forms such as Kava extracts, Instant Kava powders or Kava Candies. The extracts can be found in all kinds of flavors from coconut to chocolate to honey and lemon and just require a tiny amount to be dropped and melted under the tongue for a sub-lingual Kava sensation. As well as the taste benefits, the extracts and pellets have the added incentive that they do not require an empty stomach to feel the effects as this form of sub-lingual absorption of the active Kavalactones bypasses first-pass metabolism. Kava candies have been a fantastic innovation by Ozia. 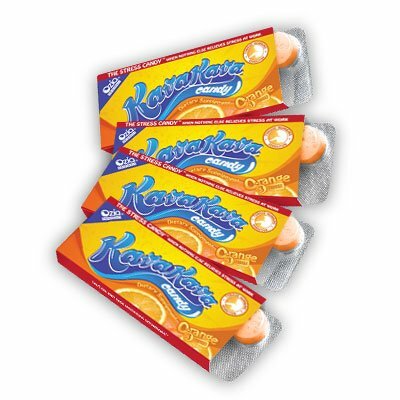 Again, just pop one under your tongue and experience the full range of Kava effects while enjoying the taste of these orange flavored sweets. These are also incredibly handy for Kava on the move or when you don’t have time for a full, traditional preparation. They taste very much like one of those orange flavor Vitamin C tablets, so no Kava nastiness in sight. They do give that slight numbing feeling, so you know you are getting your money’s worth and the effects are good enough to de-stress, take the edge off your day or are great as a small top-up when you come to the end of your Kava session and can’t be bothered to knead up another shell. A common trick to help disguise the taste of Kava is to simply use a palate cleansing chaser, most often in the form of a piece of fruit. 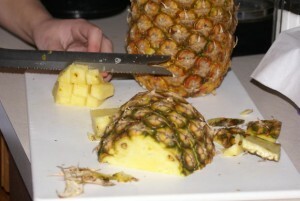 I have found that a piece of pineapple, banana, melon or a couple of segments of satsuma or orange are often good enough to clear the mouth of the bitterness, while allowing the mellow numbing feeling to continue. Many Kava connoiseurs enjoy the numbing feeling, after all, as it acts as a pre-cursor to the mellow vibe that will soon follow through the whole body. Other palate cleansers for immediately after downing a shell of Kava could include something a bit sweeter, for example candied ginger (this may also help with the slight nausea some folks experience after taking the root, especially if onto an empty stomach for maximum benefits). I have personally found that a small piece of chocolate works wonders, and helps to enhance the Kava effects as the whole milk and fat therein acts as an emulsifier on the kavalactones as they are absorbed in the stomach. Then there are Kava mixers. Traditional Kava drinking proponents would shirk at the idea of using anything else to mix your Kava drink but, in my opinion, whatever helps to get it down is up to the individual. I’ve heard all sorts of tricks that the drinker has claimed has worked from mixing the Kava beverage with orange juice, or other juice extracts, to mixing it with milk, chocolate milk or herbal tea blends. Some even mix the Kava with ginger ale in the hopes of both covering up the taste and allaying the heavy stomach hit that some users experience. If you’ve been struggling with the taste of Kava and were looking for some suggestions as to how to improve its taste at least enough to get it down the hatch, then I hope you can get some use out of these ideas. The main thing is to experiment and try your own ways of making Kava taste better, or seek out some of the new varieties and forms of Kava that are designed to make this wonderful root more palatable. I started drinking kava five days ago and found that steeping/kneading it with 4 oz orange juice and 4 oz fruity soda or a fizzy flavored water has helped cover the chalky texture and flavor of kava best. I still haven’t felt an effect from the kava yet, maybe because the liquid is cold (I bought Nambawan from BKH), but this recipe has definitely encouraged me to keep trying until it finally hits. i tried a piece of chocolate, and it takes the taste away after one bite!